I’m Selby, coach of Moreira’s Magic, the winning AFL Fantasy team in 2017. I’ve decided to release my research and analysis to fellow fantasy coaches, or anyone of interest, to make some good of my success. 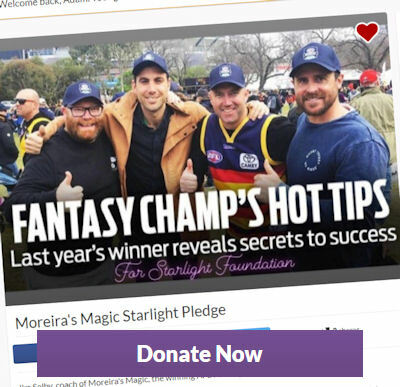 The car is great, but I’ll feel even better knowing that my win will help brighten up the lives of seriously ill children, young people and their families across Australia, not to mention helping a few battling fantasy coaches along the way! My research for the 2018 season is finished and I’ve put together a file that rates every player in the comp (all 759 of them!) in the categories I consider most fantasy relevant. I used these numbers last year and, as I’ve had my success, I want to share them with legends like you. 100% of the proceeds generated from this will be donated to the Starlight Foundation. Wait for me to email you the document! Thanks for your support and good luck in your quest for fantasy glory in 2018! Well done for doing this mate, a real legend yourself. With the success you have had it’s pretty easy to just leave it but to g out of you way and try and make a difference in others lives is great to see. Not many blokes like you in the world, great role model and a true champion! Love your work buddy, you’re the legend here! What are your last three years like in term of ladder position? If you have been in the top 1000 the two years before I will pay attention, if not, Meh! You got lucky! I don’t think u quite get it. Cheers just donated, that’s the main thing, look forward to your insights. It will probably just be information overload for me but might get some pearls of wisdom in there somewhere.